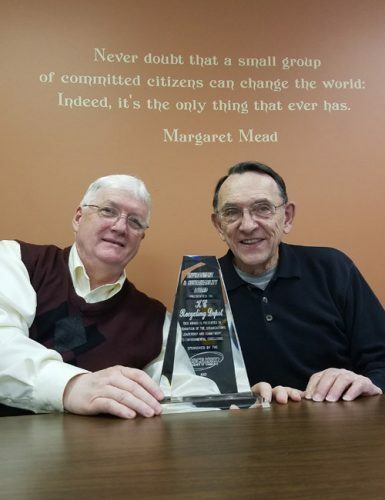 Solid Waste Board members Bob Conley and Jerry Frush with KC Recycling Depot’s Chamber award. WARSAW — The KC Recycling Depot was honored with the Environment and Sustainability Award at the Chambers Member Award Dinner Jan. 26. The Depot is staffed by a mere three people: Director Shelly Heckert, Educator Sarah Baier and household waste coordinator Jim Ault. In 2016 the solid waste district collected nearly 4.5 million pounds of materials that were then recycled or safely disposed of. This includes materials from nine recycling stations located around the county. Through their in-house programs, such as electronics and HHW collection, the Depot served over 7,000 people. At the Feb. 7 Solid Waste Board meeting, the board looked at ways at increasing that service and cutting down illegal dumping. Currently the Depot is already losing money with e-waste recycling, but is looking to provide an even further discount on special days. “Our goal is to get CRT TVs out of people’s basement,” stated Director Shelly Heckert. Heckert has expressed concern over the price of CRT TV, more commonly called “tube” TVs, recycling before, and has acknowledged that there has to be an end to the supply eventually. The cost of electronic recycling has tripled in the last year, and while the Depot’s collection rates have risen they still aren’t compensating the cost. The board stated that they rather take the loss than for the city and taxpayers to accrue an even greater cost from illegally dumped waste. Some Kosciusko residents may be curious why a few neighboring counties have free electronic recycling, and it’s due to a company, ERI, honoring contracts more than a decade old. Unfortunately, Kosciusko was not contracted with the company and cannot get on a contract. To keep up with current rates check the KC Recycling Depot website. The board passed a resolution for the Depot to begin accepting credit cards. It was approved to add the cost of a new company vehicle and forklift to the 2018 budget. It was approved for Network Solutions to redevelop the Depot’s website under a one-year contract.